At the 44th Annual NYC Pride March this Sunday, New York-area Boy Scouts will be among the groups leading the parade as they speak out against the Boy Scouts of America’s discriminatory ban on gay adults. “We are grateful for this invitation from NYC Pride, and we are honored and humbled to provide this patriotic service to the LGBT community of New York,” said Stacey Sarnicola, Brooklyn chapter lead, Scouts for Equality. 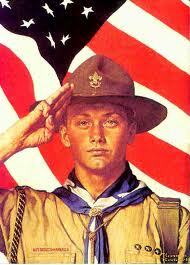 “Since 1978, the BSA has held a policy that excluded gay youth and parents. While the BSA voted last year to end the policy barring gay youth from participation, it has made no change in its membership policy regarding adults. The Greater New York Councils' inclusive policy is what gave me permission to allow my son to join the Boy Scouts. It's what gives us permission to march, and it gives us hope for a BSA for all in the near future." GLAAD adds that it remains unclear what repercussions (if any) will face the Scouts after participating in the march. 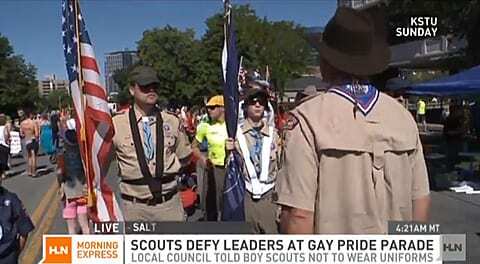 BSA policy prohibits members from using Scouting to "promote or advance any social or political agenda" and Scout leaders who have marched in past Pride parades have been reprimanded and told to sign letters of apology for the violations. 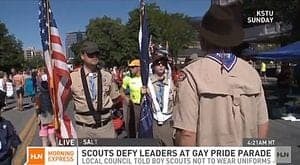 The Greater New York Councils, which serves nearly 150,000 Scouts in New York City, however, has previously emphasized its commitment to full inclusion of gay Scouts.